With X-StreamLoader you can open and record your favorite live streams or Online Videos (VOD) in a Mediaplayer like VLC on PC, Tablet or Notebook only with some few clicks. 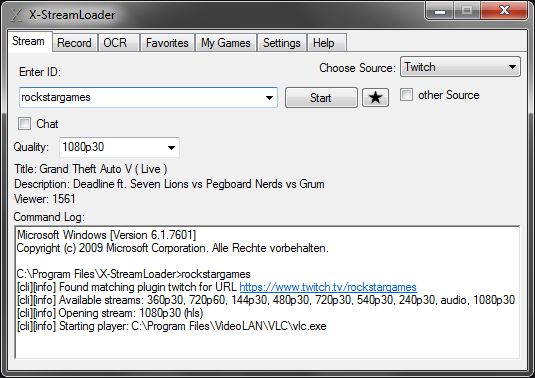 X-StreamLoader supports a lot of Stream/Videoplatforms like Twitch, Youtube, Smashcast and many more. A complete list of all platforms you find here and here. Watch Tutorial to learn more about the functions! X-StreamLoader control the command-line based software Livestreamer and Streamlink. Cause the handling with command-line or with bat files is a little bit tricky, X-StreamLoader was developed. This act as Graphic User Interface for Livestreamer and Streamlink. What's required at usage from Livestreamer? What's required at usage from Streamlink?